A couple more days and we’ll leave Mongolia. This country always will have a special place in our heart. True, the ‘roads’ in this country are the worst in the world and the shocks and thick layers of dust really put our car to the test, but the views after each hill, the emptiness, the beautiful blue skies and the endless plains of steppes make up more than enough for all of that. This country makes you breath again and feel alive. It also challenges your navigation skills. 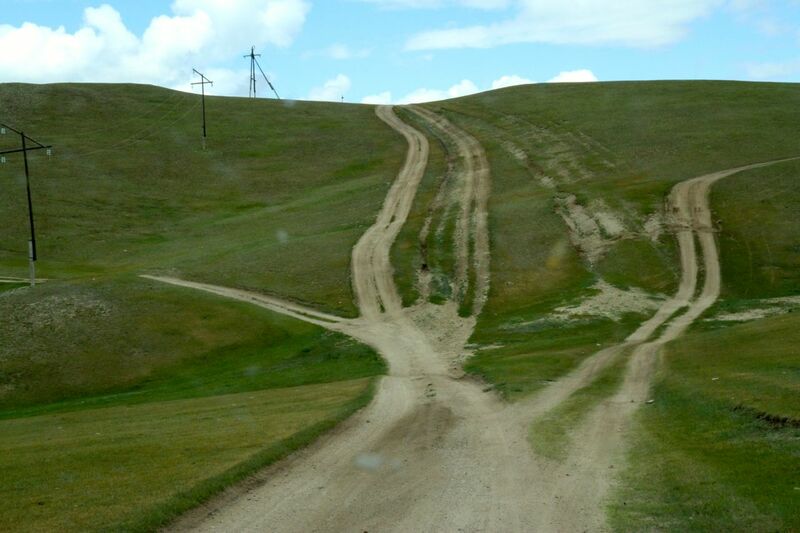 Without a GPS-system, compass or good old fashioned map it’s nearly impossible to drive certain parts here. We’re happy we brought along a satellite communicator, called Inreach SE which, paired with our iPhone, saved us more than once from complete disorientation. 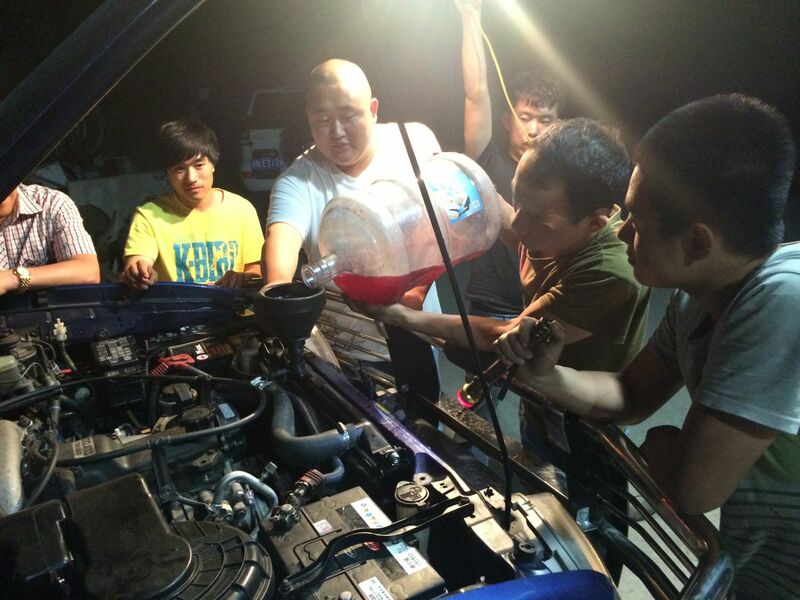 The best way to handle this challenge we found is just to keep going and not think too much about what can go wrong…. For us it worked. 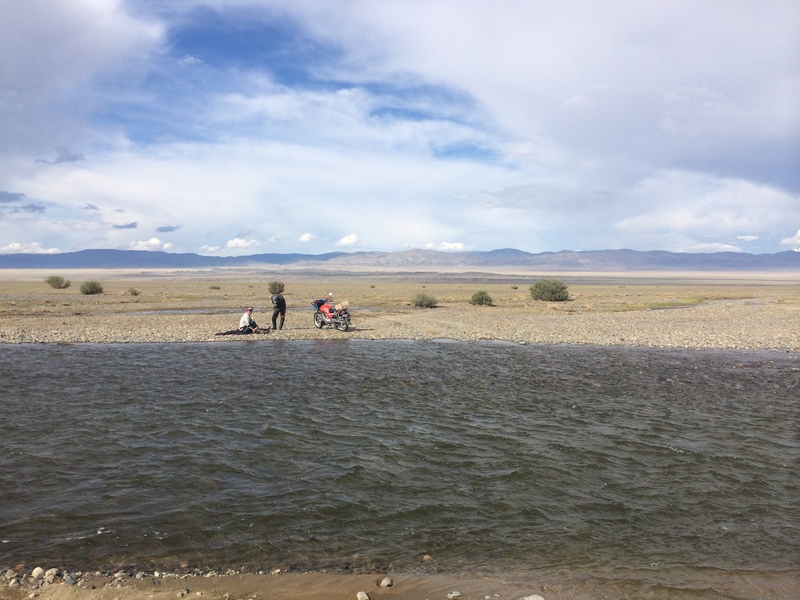 And then there is the other challenge: river crossings. 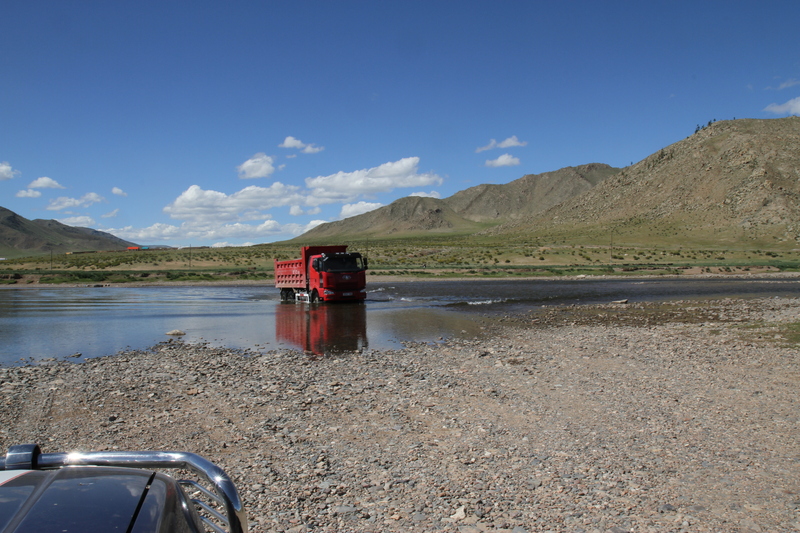 Because driving in Mongolia means driving completely off road, it also means crossing rivers without a bridge. The first time we found it very scary, although the pool we had to cross was just a foot deep. Slowly we got more confident, but as rivers got deeper and with stronger currents, we got our scare back. Our strategy now is to wade through the river by foot first and then decide whether our car can do it as well. 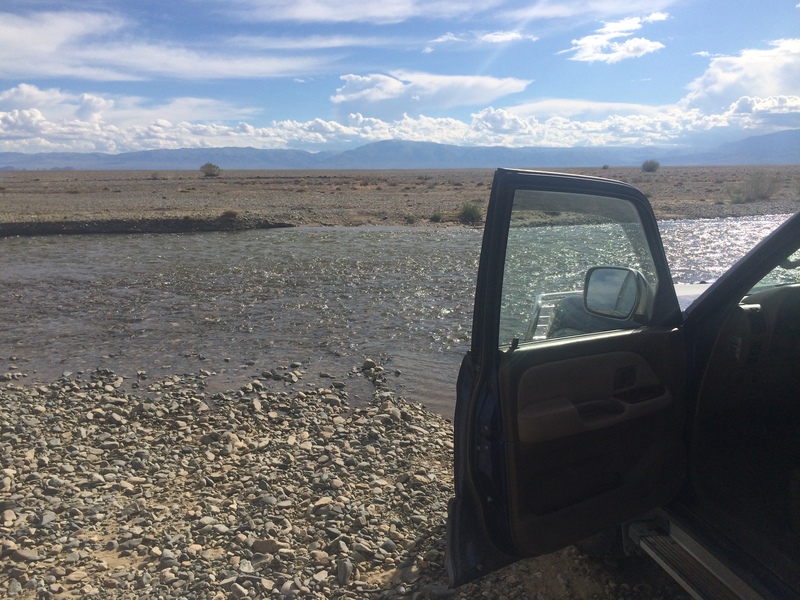 Until now we’re fine, but we skipped some rivers that we found to be too deep, which meant driving an extra 100 kilometres off road. But hey, better safe than sorry. We’re still in Olgii now waiting for the garage to open again. If it does, we’ll hopefully fix our car and leave for the Mongolian-Russian border on Monday, after hopefully visiting one of the most spectacular national parks nearby. What a trip it has been so far! The Blue Beast already took you 5000 kms so praise him! It has a respectable age of already 13 yrs! And like old people he needs medicines and fortifiers now and then, but will keep on running! The video abt the rivercrossing also brought back the good feeling reaching the other side of the river. Keep on enjoying!! Indeed, what a trip! We are tremendously enjoying your great stories and breath-taking pictures! Cheers.